Welcome to the finale of eight special podcasts created for you by some of our Disney podcasting friends. From 17th December, up to the 24th December, we will release a daily 'Minnie' show to wish each and every one of you the very best for Christmas (Xmas) hence the Minxmas name! To listen right now, click on the audio player below. To listen right now, click on the audio player below. Todays last Minxmas is brought to you by Michelle and Jayne and is a special thank you to each and every one of your for supporting the podcast for the past 4 years. Have a wonderful Christmas and if you do not celebrate - enjoy the holidays and this season of goodwill to each and every one of you. You can make sure you never miss a Disney Dream Girls Podcast by subscribing to us via iTunes (DDG iTunes page) and you can always leave us a review there for the show. 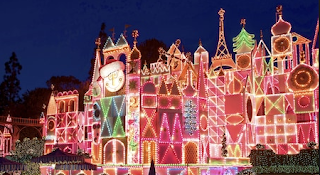 Finally, if you want to hear a trio of podcasts covering all of the Disney theme parks at Christmas relisten to our show 186 and then pop and listen to our friends over at Dis Down Under and Dis After Dark too! Welcome to the seventh of eight special podcasts created for you by some of our Disney podcasting friends. From 17th December, up to the 24th December, we will release a daily 'Minnie' show to wish each and every one of you the very best for Christmas (Xmas) hence the Minxmas name! To listen right now, click on the audio player below. To listen right now, click on the audio player below. Welcome to the sixth of eight special podcasts created for you by some of our Disney podcasting friends. From 17th December, up to the 24th December, we will release a daily 'Minnie' show to wish each and every one of you the very best for Christmas (Xmas) hence the Minxmas name! To listen right now, click on the audio player below. To listen right now, click on the audio player below. Todays Minxmas is brought to you by the MMOM Podcast. This is a podcast hosted by three men who are going to Orlando - join them as they plan to get the most out of their trips! Find out more by visiting MMOM Podcast. Welcome to the fifth of eight special podcasts created for you by some of our Disney podcasting friends. From 17th December, up to the 24th December, we will release a daily 'Minnie' show to wish each and every one of you the very best for Christmas (Xmas) hence the Minxmas name! To listen right now, click on the audio player below. Welcome to the fourth of eight special podcasts created for you by some of our Disney podcasting friends. From 17th December, up to the 24th December, we will release a daily 'Minnie' show to wish each and every one of you the very best for Christmas (Xmas) hence the Minxmas name! To listen right now, click on the audio player below. To listen right now, click on the audio player below. Welcome to the third of eight special podcasts created for you by some of our Disney podcasting friends. From 17th December, up to the 24th December, we will release a daily 'Minnie' show to wish each and every one of you the very best for Christmas (Xmas) hence the Minxmas name! To listen right now, click on the audio player below. To listen right now, click on the audio player below. Welcome to the second of eight special podcasts created for you by some of our Disney podcasting friends. From 17th December, up to the 24th December, we will release a daily 'Minnie' show to wish each and every one of you the very best for Christmas (Xmas) hence the Minxmas name! To listen right now, click on the audio player below. To listen right now, click on the audio player below. Welcome to the very first of eight special podcasts created for you by some of our Disney podcasting friends. From 17th December, up to the 24th December, we will release a daily 'Minnie' show to wish each and every one of you the very best for Christmas (Xmas) hence the Minxmas name! To listen right now, click on the audio player below. Welcome to the show notes for the Disney Dream Girls podcast for show number 189 aired on Sunday 10th December 2017. If you wish to listen to the podcast, whilst reading this blog, all you have to do is click on the audio player below. Alternatively, our podcast can be found in most places that host podcasts such as iTunes (click here to subscribe) and Stitcher Radio. Coming up on this weeks show, we have a bumper pre-Christmas edition crammed with seasonal chat. On 10th December 1903 Mary Norton was born. She was an English author and she wrote some of the classic stories most of us will have grown up with. On the podcast, we discuss The Borrowers and Bedknobs and Broomsticks, both of which were based on her work. We are pleased to announce the return of Minxmas for 2017. 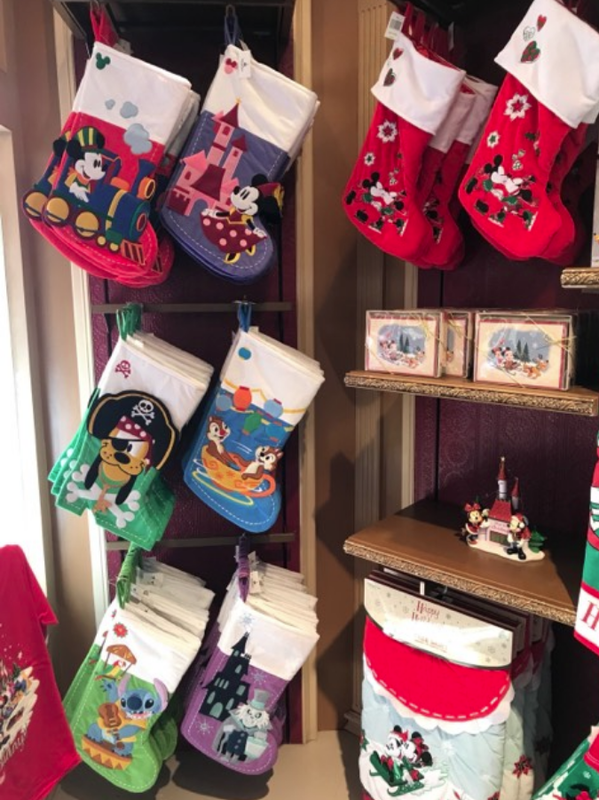 On the days leading up to Christmas, we will release a daily audio dose of Disney from a variety of Disney podcasters. We hope they will entertain, inform and prepare you for the season of goodwill. Look out for the release schedule coming soon! 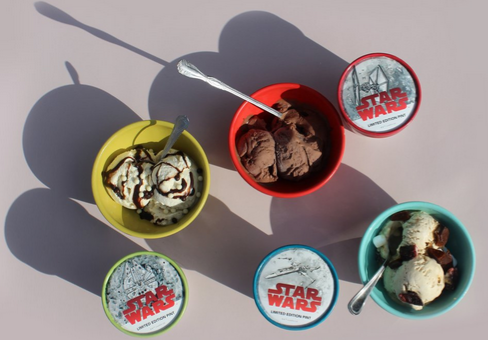 We discuss the trio of Star Wars inspired flavours from this BoardWalk, Walt Disney World location. For more information, pop to our Monthly Updates page for December to find out more! We welcome back to the podcast author and theme park fan Liliane Opsomer. 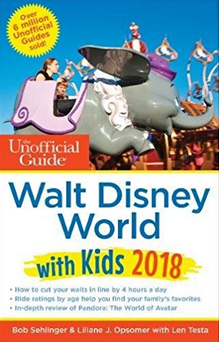 Liliane is the co-author of the Unofficial Guide to Walt Disney World with Kids and photographer to The Color Companion to Walt Disney World: The Unofficial Guide. 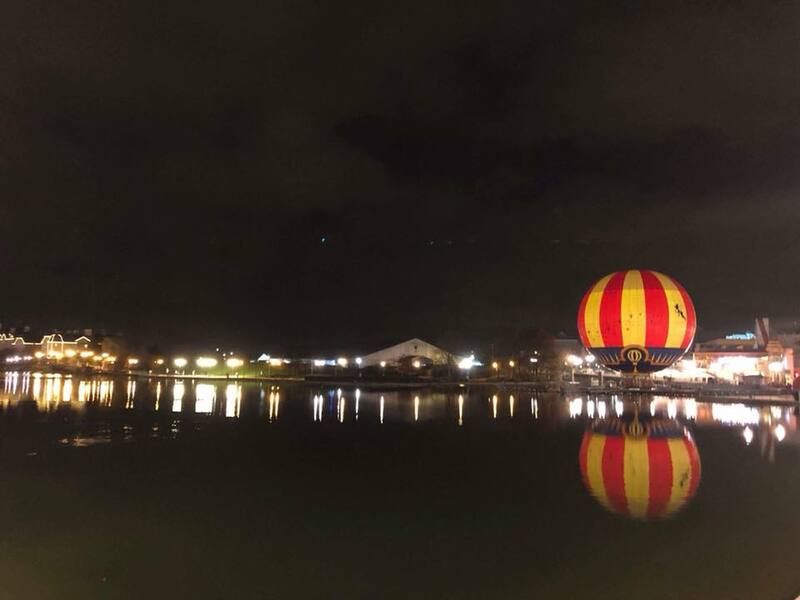 Liliane shares details about her recent trip to Walt Disney World starting with her twin Disney stay. 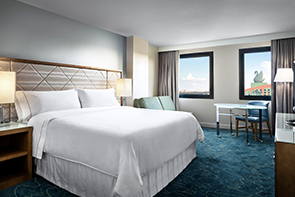 First she shares details about her stay at the Dolphin Hotel, which is situated in the EPCOT resort area. The Swan and Dolphin hotels have both undergone a three year extensive re-modelling programme and the results are stunning. 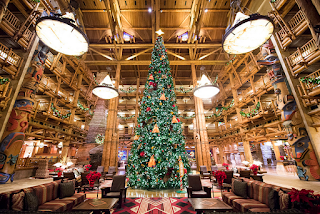 In addition to the rooms looking fabulous, Liliane shares details of the Christmas offerings at the resort. 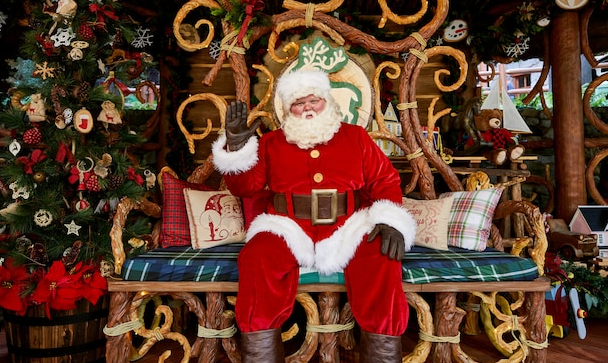 Here, guests can find Santa and Mrs Claus on their Florida pre-Christmas break. It is all good fun and gives a great Christmas feel. 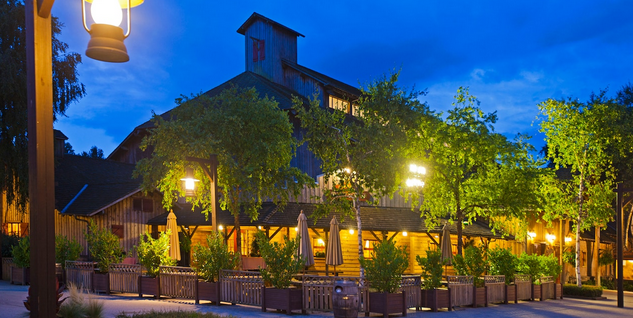 Then, Liliane moves on to talk about our favourite resort - The Wilderness Lodge. Whilst she was unable to stay at one of the new Copper Creek cabins on this trip, she will be back hopefully in March to do so! The main part of our discussion was about Walt Disney World at Christmas, so Liliane shares details about the seasonal offerings. Whilst, many people will imagine the park with the biggest Christmas hit would be the magic Kingdom. However, this was not the case... Liliane found that Disney Hollywood Studios was the most seasonal. Last on her list of favourites was EPCOT, closely followed by Animal Kingdom. 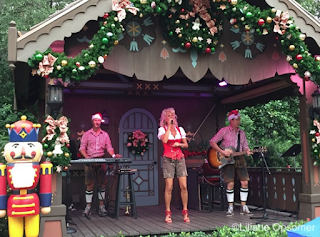 This year at EPCOT many of the Christmas Storytellers have been replaced with musical offerings. This totally was a wrong move for Liliane. Then to add to her upset, there was one too many party go-ers over indulging in alcohol. The Unofficial Guides produce a great guidebook to Universal Orlando and we couldn't resist in getting Liliane to share some of the seasonal offerings she enjoyed there. That's about it for this weeks show, we hope you enjoyed the show, and we will be back with more Disney musings next week! Why not listen to our weekly Disney theme parks podcast? You can find it in most places that host podcasts or via iTunes click this link to go to our iTunes page. If you choose to support us financially (via Patreon) we offer a range of incentives and our eternal thanks for your support - click to visit our Patreon page. Welcome to the show notes for the Disney Dream Girls podcast show number 188 aired on Sunday 3rd December 2017. If you wish to listen to the podcast, whilst reading this blog, all you have to do is click on the audio player below. Alternatively, our podcast can be found in most places that host podcasts such as iTunes (click here to subscribe) and Stitcher Radio. This show begins with going off at a tangent with details about Michelle's London trip and a special afternoon tea she took on Oxford Street. 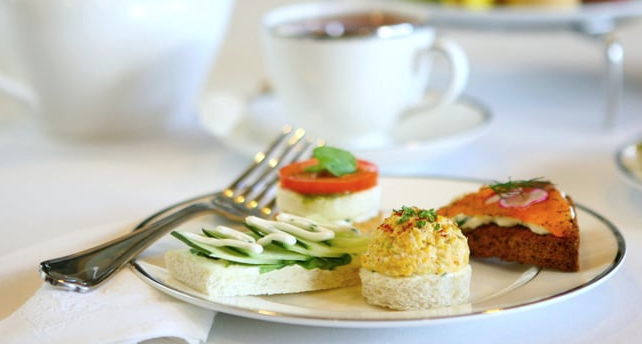 Then moving back to Disney, Michelle thought ahead to her advanced dining reservation she has for Christmas Day at Steakhouse 55 for a special holiday themed Afternoon Tea. The menu is incredibly seasonal and don't the chocolate strawberries look heavenly! Next up we unpick the story of the EPCOT pickle. If you believe the story from the Germany pavillion, every German household will have a pickle on their Christmas tree. Well not many German families seem to know this! After researching the topic, we found a heartwarming story which we hope is the true version. However, we are stumped on the history of the mushroom ornament! Then a gripe... 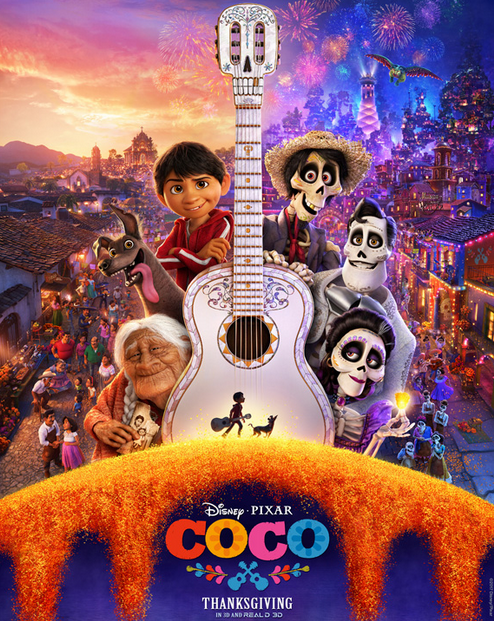 I know we do try to be positive but releasing COCO in the UK on the 19th January 2018 is a tad unfair! Especially when so many people will have had the opportunity to see it since October 2017! Totally unfair! 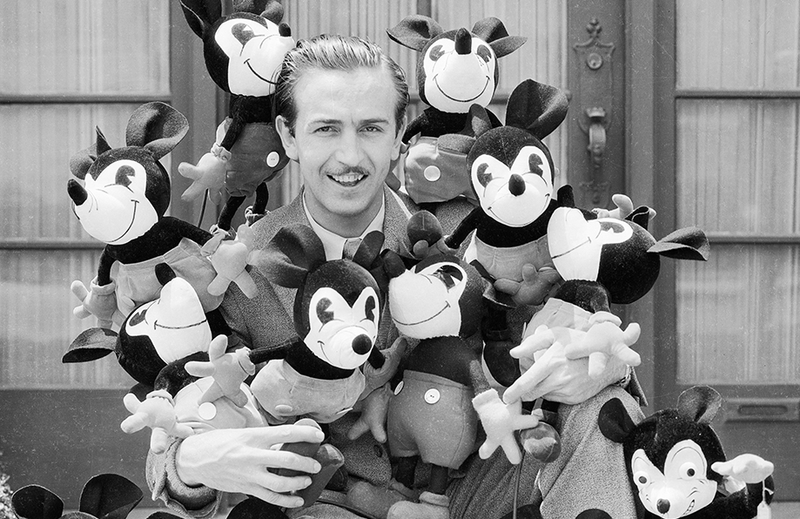 Then our main event is to say a very happy birthday to Walt Disney. Born on the 5th December 1901 to Elias and Flora Disney, Walt was the fourth son of this couple and was named after the family pastor - Walter Parr. We reached out to our Facebook page followers and asked them what they would like to do if they had the chance to spend a day with Walt in the parks. 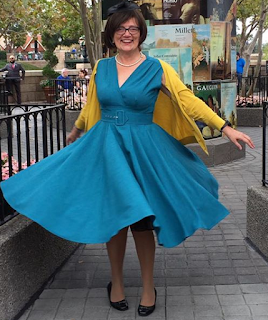 We had some lovely responses from a ride on the railroad to dining at Club 33. What would you do and what gift would you give to Walt? Please get in touch and let us know! Planning a trip to Disneyland Paris? We we at the Disney Dream Girls have visited this park numerous times and hope our podcast and blogs will inform and entertain you with our top tips. 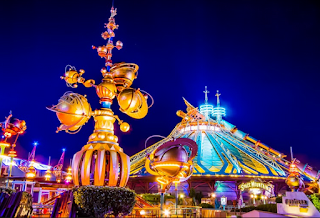 Below is the second of several blogs about visiting DLP with this one featuring what tours you can do to enhance your stay. However, for tips on things to do in the park you may wish to listen to our podcast (show 187) whilst you read these notes by clicking the player below. 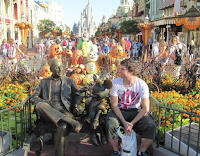 Whether you have visited the theme parks several times and are looking for something special to do or you are naturally curious about the mechanisms behind the magic, then a theme park tour is possibly for you. As in the American parks, DLP offers VIP tours. This is a bespoke service fit to suit your needs and will tour you round the park. However, the price point is quite a high one due to the personal service it offers. 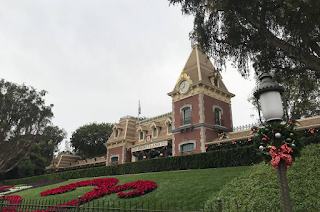 For those of use with a more modest budget, park tours will be a fabulous option and there are three options at DLP: A tour of Disneyland, A tour of Walt Disney Studios and the Tower of Terror tour. Lets start with Disneyland. This tour departs at 1pm or 2pm (this may change due for operational reasons) and costs 50 Euros for adults or 30 Euros for children. It lasts around 2 hours and there is a maximum of 10 guess per tour. How better to find out about the history of the park and its links to Walt Disney by taking this tour? It covers the five different and distinct lands you will find in the park and looks at the themes chosen. No attractions are included on this tour. The tour of Walt Disney Studio is the same price and departs at 3pm. This is a slightly shorter tour, lasting 90 minutes. This gives guests an insight to Walt's influence on the world of cinema, animation as well as the special effects currently being used in the park. 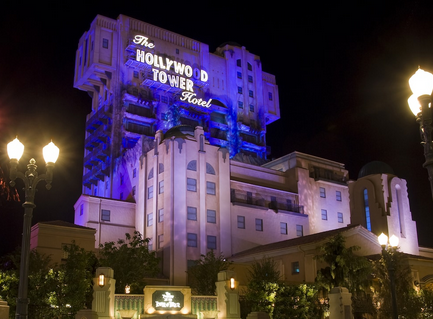 Finally, the tour of the Tower of Terror costs 40 Euros for adults and 24 for children. It is only offered on Saturdays and Wednesdays currently at 9.10am. Sadly, this is currently offered in French only. Whilst the details I have state there is no ride on the attraction included, I do find this strange. If your French is reasonable or if you are fluent then this would be a wonderful way to find out way about the secrets of this iconic attraction. We will share another post with other top tips to plan your Disneyland Paris trip real soon! Why not listen to our weekly Disney theme parks podcast? You can find it in most places that host podcasts or via iTunes click this link to go to our iTunes page. Our social media links are: Twitter @DisDreamGirls and @JaynePhipps We are quite active on Facebook so like our page - www.facebook.com/Disney Dream Girls If you have any questions or comments, please email us - info@disneydreamgirls.com We also are on Instagram - Disney_Dream_Girls Finally, you may choose to support us financially (via Patreon) we offer a range of incentives and our eternal thanks for your support - click to visit our Patreon page. DIsneyland Paris Where to Stay? 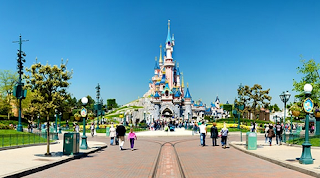 Planning a trip to Disneyland Paris? We we at the Disney Dream Girls have visited this park numerous times and hope our podcast will inform and entertain with our top tips. 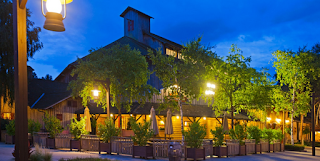 Below is the first of several blogs about visiting DLP with this one featuring hotel choices. However, for tips on things to do in the park you may wish to listen to our podcast (show 187) whilst you read these notes by clicking the player below. 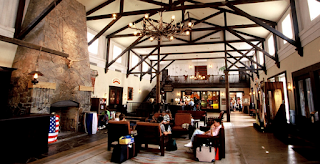 Where to stay and when to go are the most asked questions that we get. To be fair, this is such a difficult piece of advice to give because of budget constraints, non negotiables and what you want to get from your visit. However, below we share details about some of the options available to you that may help you choose which one to stay at. The Disneyland Hotel is the closest to the parks but it is also the most expensive. Disney class this hotel as a five key establishment and it boasts the top level amenties you would expect. From a simple room all the way to the Sleeping Beauty Suite you will find excellent service and a hotel with subtle Disney touches. Even if you choose not to stay here, it is worth a visit! 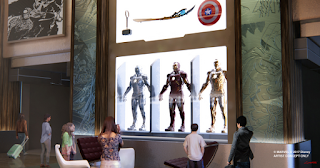 Next is the Hotel New York (which will be rethemed to a Marvel themed hotel) and this is about a five minute walk to the park plus a personal favourite of Michelle's. This is because it is very close to the parks and at the time of her stays was themed in a New York Art Deco style. Again there are a variety of room options and it is rated 4 keys. Be aware this hotel closes for its make-over in October 2018. After that, you can choose between Newport Bay Club and Sequoia Lodge - they both are a fifteen minute walk. 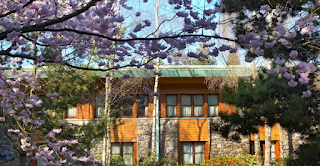 Jayne stayed at the Sequoia Lodge the other year for her February family trip and loved the theming (very reminiscent of the Wilderness Lodge at Walt Disney World) as well as finding the walk into the park being very scenic. 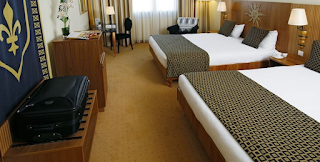 Whilst it is a lesser rated hotel (holding four keys in comparision to Newport Bay Clubs four), it does have a range of amentities and whilst the rooms are small they are well appointed. On the other hand, Newport Bay Club, with its 1900 coastal mansion style, was totally refubished in Spring 2016 and we have heard nothing but good things about it. It is beautifully situated on the edge of Lake Disney and has maritime touches throughout. Don't the rooms just look amazing? Moving slightly further out from the parks, are Hotel Cheyenne and Santa Fe - both having a twenty minute walk. Both have a two key rating and a bolder, more Disney style theming to the other hotels. 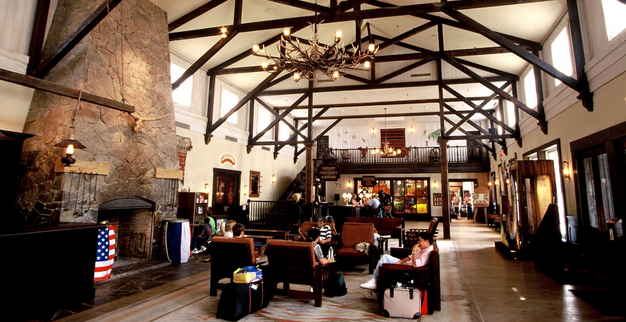 The Cheyenne has an old-time western vibe and offers rooms to sleep upto four people. 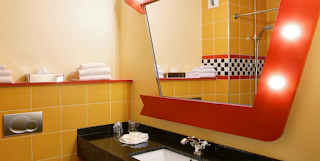 For the feel of being on Route 66, choose the hotel Santa Fe. All of the above hotels offer a free shuttle service which drops you off at the Disney Village. There is a final option and that is the Davy Crocket Ranch however there is no shuttle and it is a fifteen minute drive away. But this hotel does offer the ability to stay in log cabins and a closer proximity to nature. Hotel guests get extra magic hour entry to the parks. 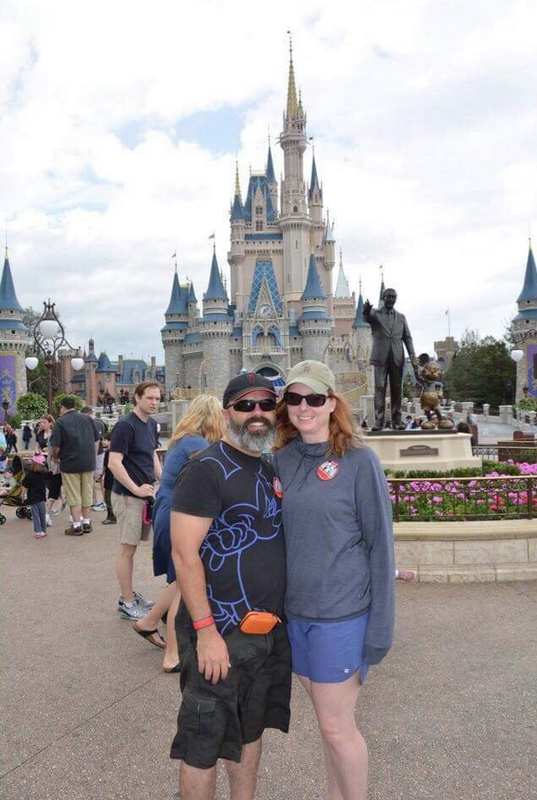 When Michelle and Jayne went to the parks together in 2017 they stayed off site at the Vienna Dream Castle Hotel. Whilst the theming to us seemed strange, it was incredibly comfortable and included a continental breakfast. 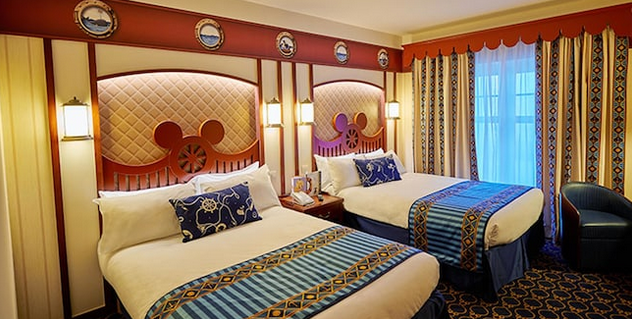 Disney have nine partner hotels, all of which you can access via the shuttle service. In fact, so close you can get to the park within twenty minutes and to be fair some are closer than the Disney hotels! They may not have the Disney extras but you can often get some very good deals. So where you stay really is down to your budget and amount of time you spend in your room to make use of the amenities. 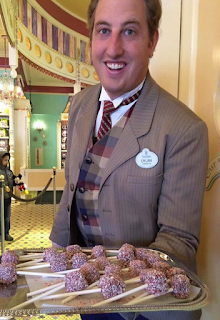 You want to know about the stunning food offerings in the USA Disney parks this season? Well read on because this post covers the Disneyland Resort at Christmas. However, did you know you can also listen to us? Just click the play icon below! Todays commentary is brought to you by Michelle from the Disney Dream Girls Podcast, Kat and Lewis from Dis Down Under Podcast and Nic Branch from Dis After Dark Podcast. Below you will find some highlights that are being offered at The Disneyland Resort in Anaheim, California. On our podcast, The Disney Dream Girls (on show 186 we cover both Walt Disney World and Disneyland), we go into lots of detail so be sure to listen! 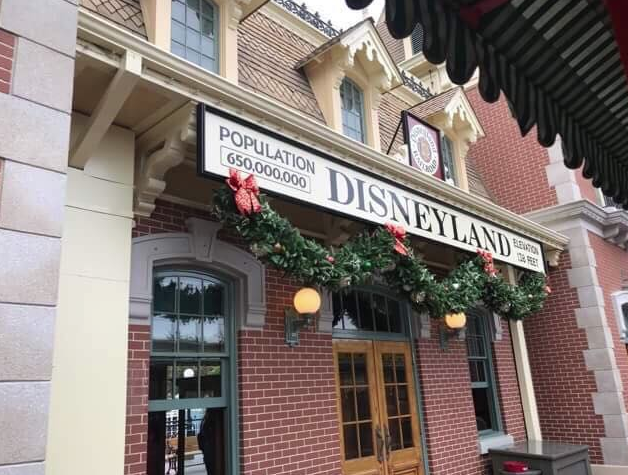 Our first stop is Disneyland itself - the original and the best. So what is there to do here during the festive season? First of all, lets talk about the attractions. 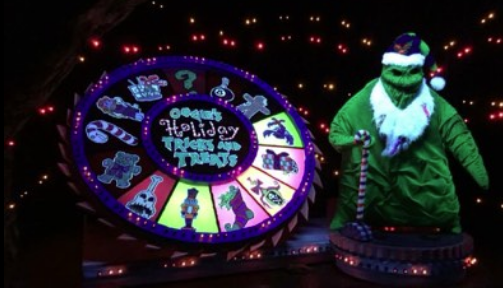 Two attractions receive a Christmas make over - its A Small World and the Haunted Mansion. They are great fun but the lines do get very long! In previous years Jungle Cruise received a make over but alas not this year. You may wish to enhance your day with the Holiday Time at Disneyland tour. 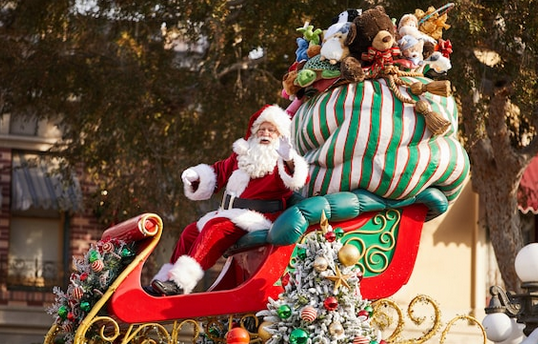 This costs $85 and includes the history and backstory of the decorations, rides on select attractions, Christmas snacks, a souvenir pin, a re-usuable mug and parade viewing with hot cocoa (more on parades below). Santa of course is in town for meets and greets and he can be found in Critter Country but this is a busy meet and greet! Each day the tree is lit and additionally, there is a castle stage lighting ceremony with gingerbread scented snow - this is not to be missed! Above the parade was mentioned and this is currently The Christmas Fantasy Parade. 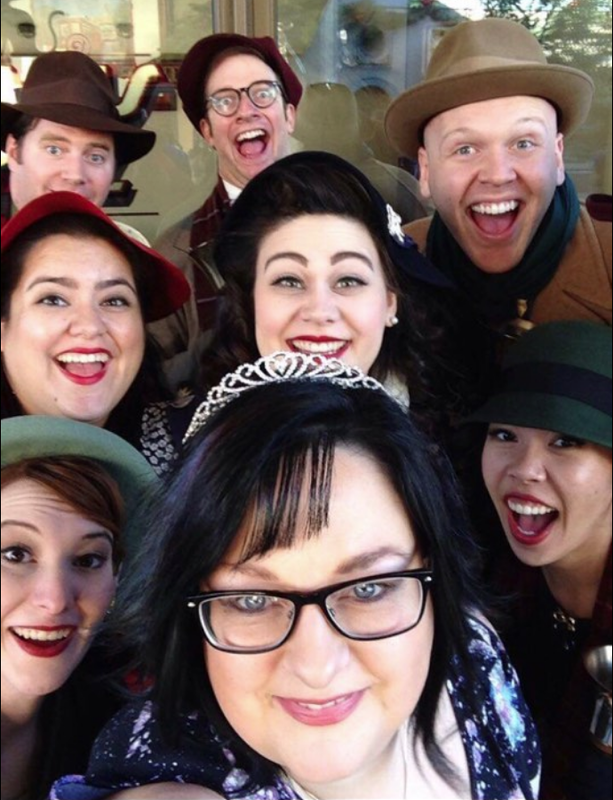 This is a forty minute cavalcade of characters and Christmas cheer with a soundtrack that will stay every present! It appears twice daily and be sure to ensure you find a spot plenty of time in advance. 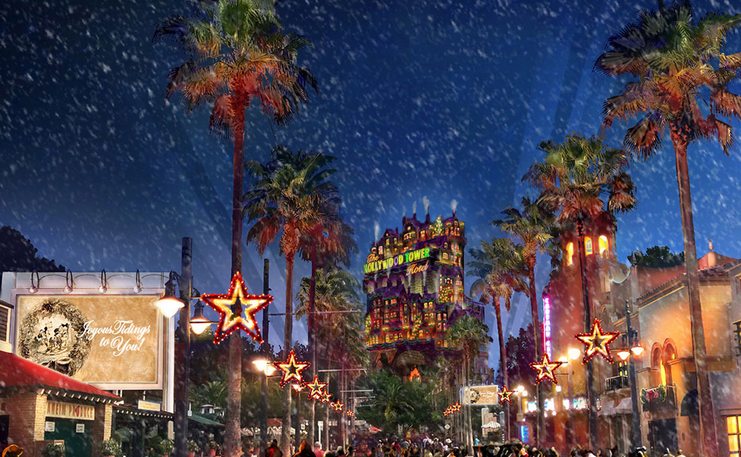 The evening ends with the firework spectacular Believe... in holiday magic. Whilst in Disneyland, there are plenty of foodie treats to enjoy. You may have heard of the delicious candy canes and you can find out more by reading our blog about them (Candy Cane Schedule 2017). 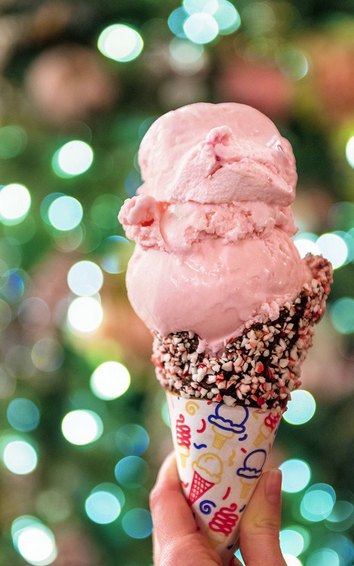 Another firm favourite is the peppermint ice cream served in a chocolate dipped waffle cone that is showered in candy cane dust - definately worth the lines! Let's hop over to Disney California Adventure as this is where the food and drink talk gets serious! Before we indulge, there are other things to do! Each of the lands is decorated in an appropriate style to its theming but my favourite is Radiator Springs. 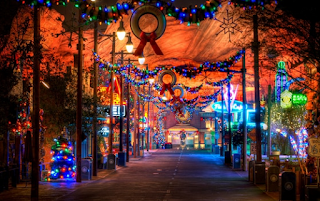 There you will find two attractions with Christmas seasonal music -Luigi's Joy to the Whirl and Mater's Jingle Jamboree as well as Radiator Springs Racers. The decor is outstanding and remember to view the switching on of the neon - its quite a thing! 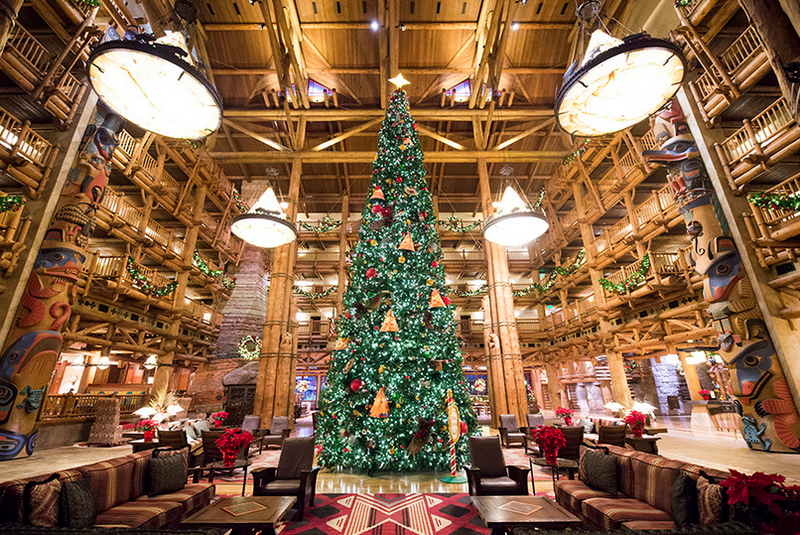 A visit must include seeing Santa at the Redwood Trail and perhaps finding time to venture into the Grand Californian and the Disneyland Hotel could be squeezed in as they have some amazing Christmas offerings to see and do. On an evening, you are able to see the World of Color - Season of Light and it runs until 7th January. Fastpass is available to guarantee a viewing sport but you could choose to pay extra for a dining package or a dessert party. Personally, a top tip would be to get the Carthay Circle lunch package as the food is delicious! 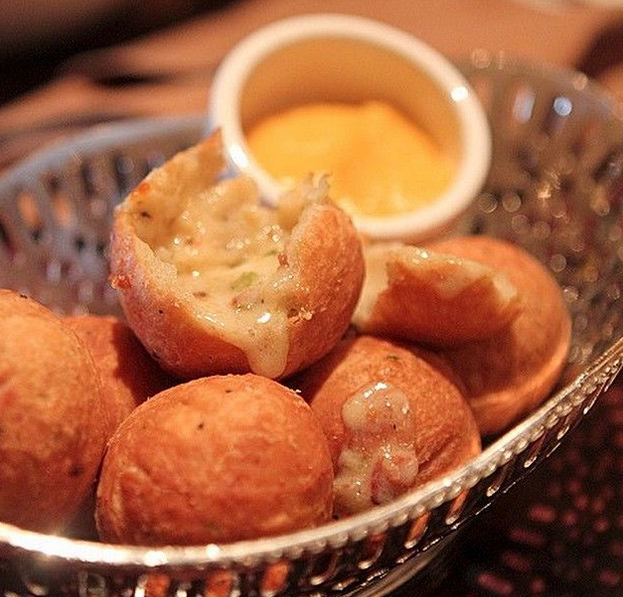 Make sure you get the biscuits... they are spherical balls of goodness and you will thank us later! The park has some great seasonal musical 'streetmosphere' and a favourite is listening to the Buena Vista Street Community Bell Ringers. We share a short sample for you to enjoy on the podcast. 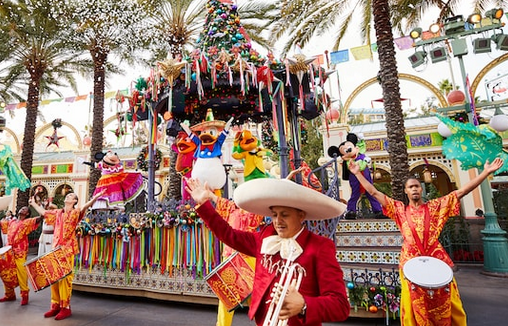 The final entertainment offering we will discuss is Viva Navidad, which takes place in the Paradise Pier Area. It is colourful, engaging and well worth seeing. 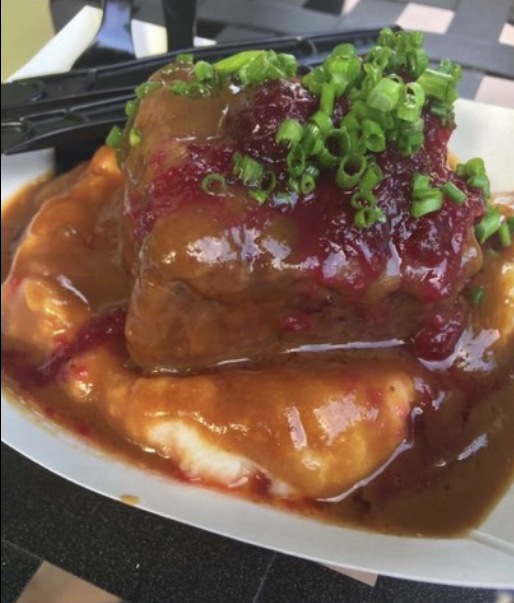 So food... Luckily for visitors, DCA is hosting the Festival of Holidays and it has kiosks bursting with food and drinks that are screaming at you to try. We could spend the entire post detailing every one however, we have chosen a few must tries! From Food at Joy to the Sauce, you will find the short rib beef with smashed potatoes and gravy for $7.75 and for dessert we recommend the sticky toffee pudding. Our beverage of choice is available at Festive Holiday Extras and is the Warm Bourbon Cider for $12. 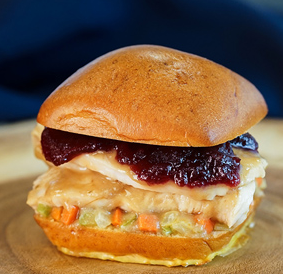 Or for a more seasonal offering the turkey slider from Winter Sliderland looks fantastic! Whilst this show shares some of the many festive delights for the Disneyland Resort, we have a previous post that includes everything for Walt Disney World - so please check that out also! I'd like to thank our guests, Nic from the Dis After Dark Podcast (click to listen) and Kat and Lewis from the Dis Down Under Podcast (click to listen). They will be sharing our top tips for the other Disney theme parks on their shows in the next few days.